The 1913 Washington Suffrage Parade was led by Jane Burleson, the grand marshall of the parade. 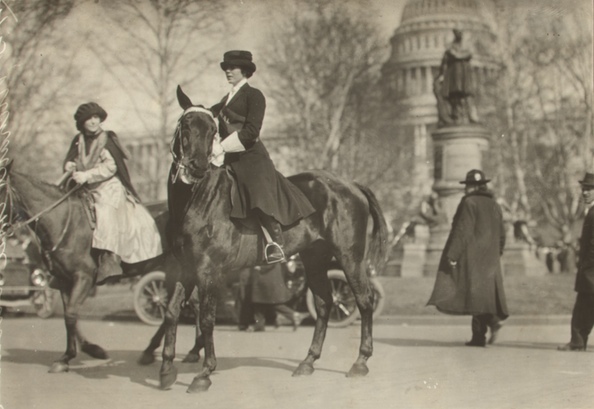 Burleson was a well-known horsewoman in Washington, and her confidence in the saddle is evident from this picture. Burleson led more than 5,000 parade participants up Pennsylvania Avenue and into a melee that changed the direction of the suffrage movement. More about the parade can be found in Seeing Suffrage​: The 1913 Washington Suffrage Parade, Its Pictures and Its Effect on the American Political Landscape here: http://www.jprof.com/?p=1741. Burleson herself came to a sad end. In the 1930s she shot and killed the wife of her ex-husband and spent several years in a South Carolina prison. Afterwards, she lived in Galveston, Texas, until she died in the 1950s. As a convicted felon, she was unable to vote.